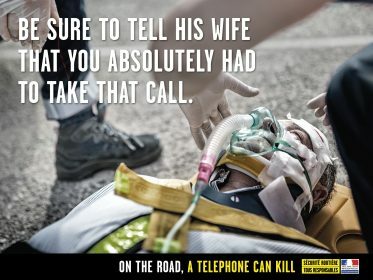 The outdoor and print campaign, which follows several award-winning collaborations, centres on the use of phones while driving, drawing in the viewer’s attention with taglines that focus on consequences, making viewers consider what it would feel like to be responsible for an accident. In its new poster and radio campaign, released on April 2nd, Sécurité Routière highlights the absurdity of people’s compulsive use of the telephone behind the wheel in light of the huge risks incurred. The posters have heart-rendering messages such as: “Be sure to tell his children that you really had to answer that SMS”, “Be sure to tell his wife that you absolutely had to take that call”, “Be sure to tell his family that you positively had to read that email”. 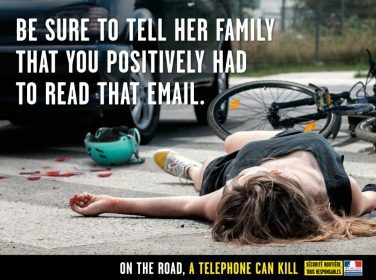 These dramatic statements, printed over images of lifeless bodies, draw the attention of road users to the dangers of mobile phone distraction.